Note from Pastor Kevin Lea: I couldn’t agree more with Bill Salus’ analysis of these very important prophecies. Current Middle East events suggest that the 2600 year old prophecy of Ezekiel 38 is about to happen. 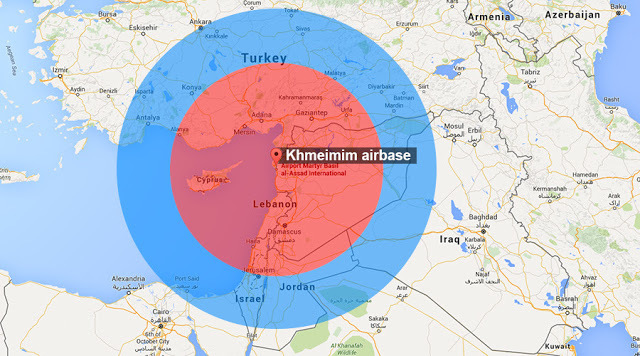 Russia’s military intervention into Syria in September of 2015 strongly reinforced this probability. This action put Russia, the apparent lead nation of the Ezekiel invasion, at Israel’s doorstep. Shortly afterward, Russia deployed their state of the art S-400 missile defense system into Syria, which essentially gained them control over most Mideast airspace. Turkey’s present political rifts with Israel and Iran’s advanced nuclear program, coupled with Iran’s stated intentions to wipe Israel off of the map, also increases the possibilities that Ezekiel 38 could occur soon. Russia, Turkey, and Iran are identified among the invaders in Ezekiel 38:1-6. They are among a nine member coalition that invades Israel in the end times to capture plunder and booty. These developments above, along with flurries of other geo-political factors, have many prophecy buffs buzzing about the potential immanency of Ezekiel 38. However, we must avoid getting swept away in the sensationalism of newspaper exegesis, which is an attempt to connect current events with ancient biblical predictions. Current events can evidence the forthcoming of a Bible prophecy, but they have to match the predicted details exactly to warrant merit. For instance, Russia intervenes into Syria. This hints that Ezekiel 38 is nearing because Russia’s military has moved into the Mideast theater. However, a few weeks later a Russian fighter jet gets struck down by Turkey. This prompts Russia to swiftly levy economic sanctions against Turkey, which result in a serious setback in their national relations. This friction is not conducive to the fulfillment of Ezekiel 38 because Russia and Turkey are allies in the prophecy. See how the headlines below and their correlating succession of dates evidence the flaws of newspaper exegesis. On September 30, 2015, Ezekiel 38 looked like it was about to happen, but less than 60 days later a serious schism develops between Turkey and Russia. In reality, Ezekiel 38 has significant preconditions preventing its prophetic fulfillment. Ezekiel 38:8-13 mandates that Israel must be dwelling securely, without walls, bars, or gates, and in the center of their land, probably alluding to the landmass described in Genesis 15:18. Additionally, the Jewish State must be in receipt of great spoil. In my estimation, Israel today is not fulfilling these conditions. Israel is unable to dwell securely as a result of the hostile Arab volatility that surrounds them. Walls, bars, and gates exist in Israel today in order to protect the Israelis from being terrorized by Hamas, Hezbollah, ISIS and the Palestinians in general. In fact, Israel is probably the most fenced in country in the world. It has fencing at various stretches along all of its land based borders. Additionally, the goal of the Ezekiel 38 invaders is to destroy Israel and take plunder and great spoil. Although Israel’s economy is flourishing, it’s debatable if it presently possesses the great spoil that Russia and their coalition someday come after. Ezekiel 38 describes nine distinct populations by their ancient names including Russia, Iran, Turkey, and Libya but omits the historic name equivalents of Arab states and terrorist populations that share common borders with Israel. Some of those who advocate that Ezekiel 38 is imminent teach that the surrounding Arab nations are identified indirectly in Ezekiel 38:6. They teach that the clause, “many peoples with thee,” includes the neighboring Arab states. However, there are three potential problems with this line of teaching. The Arab states and terrorist populations within them are pinpointed directly in a distinctly different prophecy described in Psalm 83. The Psalm lists ten entirely separate members not included among the Ezekiel 38:1-6 invaders. Thus, it is probable that they are not among the “many peoples with thee” in Ezekiel 38:6, but are “many peoples distinct from thee”, not listed in Ezekiel 38 among the invaders. The hordes of Ezekiel 38 invaders must cross over much of the land possessed by these Psalm 83 nations and / or territories presently occupied by the terrorist populations in order to invade the nation of Israel. This beckons the question; why aren’t these nations, terrorists, or refugees listed among the Ezekiel 38 invaders? Most importantly, Ezekiel 38 identifies nine specific invading populations, but oddly doesn’t mention any of the Psalm 83 Arab confederates among them. This conspicuous omission makes no sense when you consider that Ezekiel references all of the Psalm 83 members numerous times elsewhere throughout his prophetic book. Case in point, Ezekiel lists Tyre 12 times. Tyre is a member of Psalm 83 and likely represents the Hezbollah today. He alludes to Philistia and / or Philistines 4 times. They are probably the Hamas terrorist organization. Edom or the Edomites are referenced 7 times. Asaph, the author of Psalm 83, calls them the tents of Edom and I interpret that as today’s Palestinian refugees. The other Psalm 83 members like, Moab or Moabites, Ammon or Ammonites, Amalakites, Egyptians, Assyrians, Gebal (Lebanon), and the Saudis under the ancient banners of Dedan or the Ishmaelites, are also referenced elsewhere in the book of Ezekiel. Actually, all together the above Psalm 83 confederates are mentioned 89 times by Ezekiel. Not one of those 89 references shows up in Ezekiel 38-39, with the exception of a potential Saudi contingent represented by Dedan in Ezekiel 38:13. But in this instance, Dedan appears to abstain from enjoining with the Ezekiel invaders. This suggests they play no military role in this invasion of Israel. Ezekiel 25:13 informs that many in Dedan will be killed in a war, which could be the result of the Psalm 83 war. If so, this might be the reason Saudi Arabia opts out of the Ezekiel invasion. 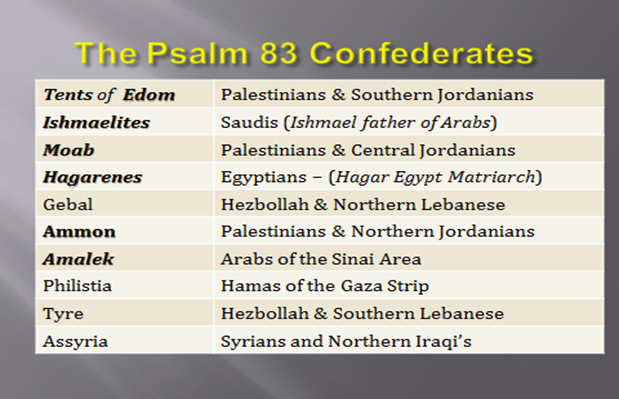 I believe the glaring omission of the Psalm 83 Arab confederates from the Ezekiel 38 list of invaders suggests they are not part of the Ezekiel 38-39 invasion. It is highly possible that they are defeated prior to fulfillment of Ezekiel 38. This article points out some, but not all, of the significant problems with teaching that Ezekiel 38 is an imminent prophecy.